Chayote Guisado or Sayote Guisado (Sautéed Chayote) is one of the Filipino recipes found in the recipe database that my family and me loves to eat. Here in Canada, you can find chayote in most Asian stores and sometimes to known grocery stores like No Frills and Price Choppers. At first, I thought I couldn’t find this chayote in our local community and getting one of it, take me an hour drive to have it. I was surprise to see chayote in the shelf of our local grocery. The funny thing was, when I’m about to pay this chayote, the cashier didn’t know its name and take us long time to figure out where to get its price. And after a long search, the chayote was under squash-vegetable category and its name was chayote squash. In a pan, heat oil over medium heat. 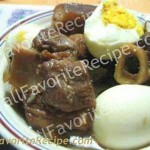 Cook pork until it turns slightly brown. Add garlic, onions and tomatoes. Sauté for a few minutes until tomatoes wilted. Add chayote slices. Season with patis, salt and pepper. Stir-fry for few minutes until well blended. Pour in water and bring to boil. Cover, lower the heat and let it simmer until chayote is tender. Correct the seasonings according to your style and liking. Have You Tried These Other Filipino Food? wow. 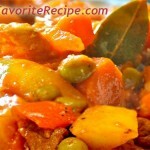 great chayote recipe, i like that. 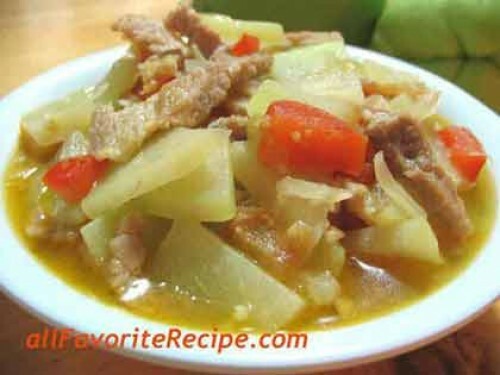 chayote guisado, is the one of the best recipe (Pilipino)… My husband is surprise when he taste the chayote guisado… now he like it… thanks filipino Recipes….